(Web Desk) – Ever imagined going to work like the Jetsons? Well, now that may just be a possibility as flying in the comfort of your own car to work is now becoming a reality. The Dutch built PAL-V (The Personal Air Land Vehicle) Liberty has been working on developing flying cars since 2012, now they are in the process of delivering their customers fully operational flying cars by the end of 2018. What makes PAL(V) unique is the company is first of its own kind for producing flying cars that will hit the market by the end of 2018. Companies like AeroMobil and Terrfugia, are also working their way into the consumer market by launching futuristic aero-vehicles. First edition of their sport version will roughly cost around €299,000 EUR (34,992,937 PKR). To aim for this dream car the customers have to acquire both flying and driving licenses before its operation approval, each car will undergo 150 hours of flight testing. Toyota also plans on designing a flying car that will solely be used for carrying Olympic torch for 2020 Tokyo Olympics. 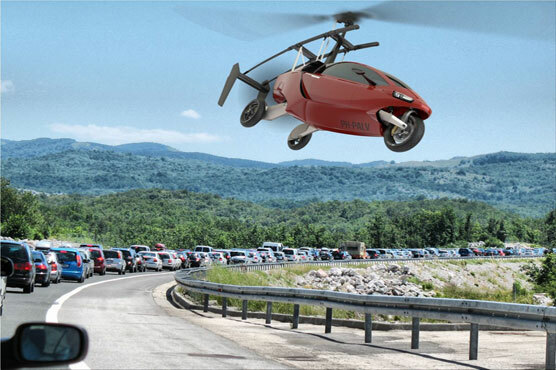 The company has no plans on a flying car mass production. Flying cars are indeed the future of our transportation means, they might decrease traffic blockage, cut down the airport flight times. Critics for mass production pointed out, air traffic on this level will produce a lot of noise and wind. Others concerns are related to its safety, if there’s a collision between these cars, passengers and debris could end up falling from the sky. Although, PAL-V has tried to issue its gyrocopter (light single-seater autogiro) keeping speed at check with safety features. Though the launching of this car has brought a lot of excitement across the world, and raised legitimate concerns, it is yet to be seen how major companies will handle the production along with major obstacles related to air traffic safety.